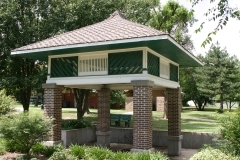 The 15-acre Bartlett Arboretum is located at the edge of the small agricultural community of Belle Plaine in Sumner County. Euphrates Creek runs through the property making a circuitous route to the Ninnescah River two miles downstream. What began as an undeveloped, treeless parcel of land alongside the railroad tracks on the edge of town was transformed first into a recreational landscape with athletic fields, picnic areas, and a waterfowl preserve with a variety of plant and tree species, and later, an arboretum complete with a designed formal garden, nursery, and hundreds of species of plants. There were two primary phases of development. The first transformation occurred in 1910 with the construction of athletic fields, damming of the creek, planting of trees, and introduction of waterfowl and fish. 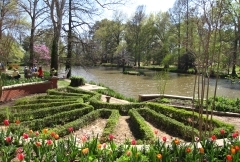 The second major phase of development began in the mid-1920s with the creation of the formal garden and floral plantings and was intended to evolve and renew with each planting season. Other elements and structures have been introduced to the landscape since the 1920s, including a nursery to develop and experiment with a variety of plant species, but in a manner that enhances its intended design. It was nominated for its landscape architecture. 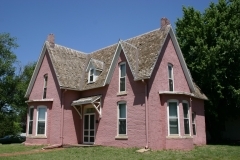 Belleview School was constructed in 1894 as a one-room country schoolhouse that served rural students in Sumner County's district 68 until it closed in 1956. The district's first building was erected in 1878 on land in Caldwell Township, and it is not known why a new building was needed in 1894. The Chisholm Trail - a trade route linking the Arkansas River valley with the Indian Territory that was later used as a cattle-driving route - passed through the Caldwell area. As a result, this vicinity witnessed rapid population and commercial growth when the county was opened for white settlement in 1870. 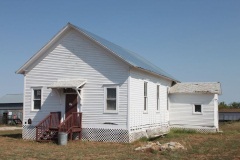 One-room schools popped up throughout the township during the 1870s and 1880s. 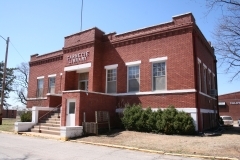 After Belleview School closed in 1956, the building was used as a polling place until 1998. It sat vacant for nearly 15 years before the township sold it to the current owners who relocated it to their nearby farm in 2009. 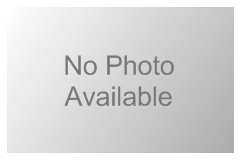 It is nominated for its association with local education. Wellington was founded in 1871, but the first railroad, the Santa Fe, did not arrive until 1879. During these first eight years, businesses constructed buildings using locally available materials. 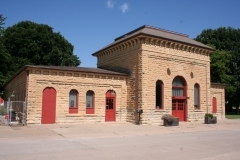 The first permanent masonry buildings were constructed in the years immediately following the arrival of the railroad. Some buildings, like the Arlington Hotel (1883), were built using local brick. 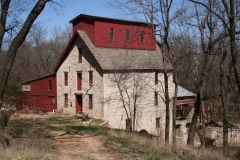 Others, like the Marble Block (1885) were constructed of local limestone. 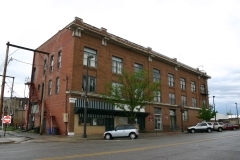 Through the years, these permanent buildings replaced the wood fronts, and by the early twentieth century, hard-fired pressed brick had replaced soft local brick as the preferred construction material. 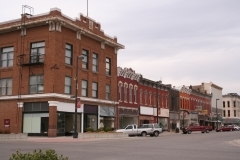 As a collection, the buildings in downtown Wellington interpret the history of the community's permanent commercial development, from the construction of the first masonry buildings in the late 1870s to the construction of free-standing office buildings in the 1950s.